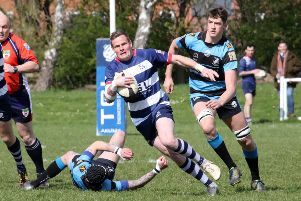 Banbury Bulls player-coach Matt Goode heaped praise on his players after they beat second-placed Old Centralians in Saturday’s crucial Wadworth 6X South West One West clash. Bulls emerged 17-14 victors at the DCS Stadium where they had to withstand almost constant pressure from the visitors in the second half. Sam Stoop and then Sam Carr-Archer both picked up yellow cards, and the visitors pressure finally paid off when Michael Mathers burst through a gap with Morgan adding the extras. Gray got a yellow card in the closing stages as Bulls fought to keep Centralians out. Goode said: “It shows what we’re about, it shows the camaraderie and what we truly believe in. Old Centralians are an outstanding side, that’s why they’re second in the league. They played some good rugby and didn’t give us a lot of ball to play with. “It was tough at the end, we made some mistakes to let them back in the game. I’m a bit disappointed we let them get a point but it’s a win and we’re back on track.